rocky's bru: MRT: Were we foolish to have wanted, built it? Too big, too early, too lavish. 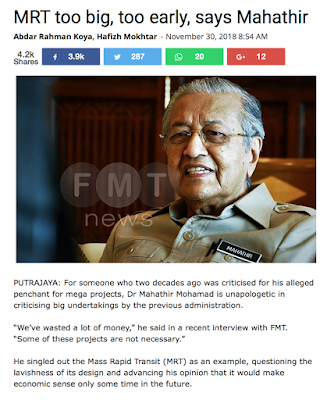 I won't know what's lavish - read MRT too big, too early, says PM - where the MRT design, trains, etc are concerned. Some people have said the same about some of Dr M's projects in the past, for example the bridges of Putrajaya and the mosques when I could only see beauty and class then what others were calling lavish. Subjective, perhaps? Or selective? But I - like Dr M, I assume - don't use the MRT to commute. I have heard, though, of how packed and congested "like tin sardin" the MRT trains can be during peak hours. So perhaps the system's not big enough, contrary to Dr M's assertion? Certainly it can't be "too soon". If we build the MRT in 2050, imagine how much it would cost. Singapore, for example, had theirs running in 1987. When the idea of building the MRT system cropped up, some of the politicians were dead against it. One even called the the idea "foolish". Try telling a Singaporean to imagine life without the MRT today. Jamban-tan bengkok tak lavish. 3rd national car clogged Road system lagi not lavish. KCD and dome Perkasa diehard would say it is necessary and essential. This MRT is the best BN government have left for the people , I use it everyday , save a lot on the transport cost to work and reduce my stress. Its wrong to say its to big or too early , I think its too late and too little been provided . They should have more built rather then have a third car manufacturing . Sorry I think Mahathir comments is completely wrong and out of date same like him . mai time dia semua ok. hat orang semua tak ok. Kata negarawan. Hat betoi habaq betoi la. Hat tak betoi nak bantai tu bantai la. Enough of this. Hampa semua menyerabutkan sekalian bangsa.